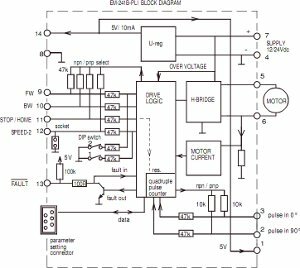 EM-241 is a full bridge DC-motor starter. It is designed to work with DC-motor in applications where some special functions are needed. Starter has adjustable acceleration and deceleration ramps, which make possible the smooth starts and stops. Adjustable current limit protects motor against overcurrent and it can also be used as an end-stop. This device has also two settable speeds, which are usefull in positioning applications. Control inputs FW and BW start the forward and backward run. STOP is for the motor shut-down. In -PLI version there are also PULSE COUNTER which can be used for end limit use. This counter value keep in memory of card also when power is turned off. SPEED-2 input activates preset speed-2, but it can also be used as input for analog speed control signal 0-5V. FAULT terminal has at the same time input and output function, the pin is normally high, but is pulled down in overheat and conditionally also in current trip situation. If FAULT-line is pulled down externally it will cause a stop and prevent the new start. For example, it is possible to link fault pins of several units together and achieve a syncronous stop.